Listen to the classical quartet as it returns to Segerstrom Center for the Arts. 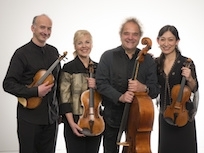 Takács Quartet is returning the center after welcoming a second violinist, Harumi Rhodes. The quartet’s name means “weaver” in Hungarian, which is perfectly representative of its inspiring performances.